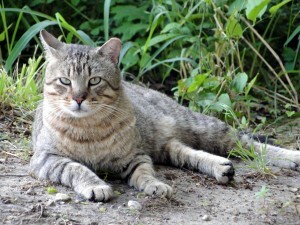 More on the community cat colonies missing in Fort Worth, Texas. 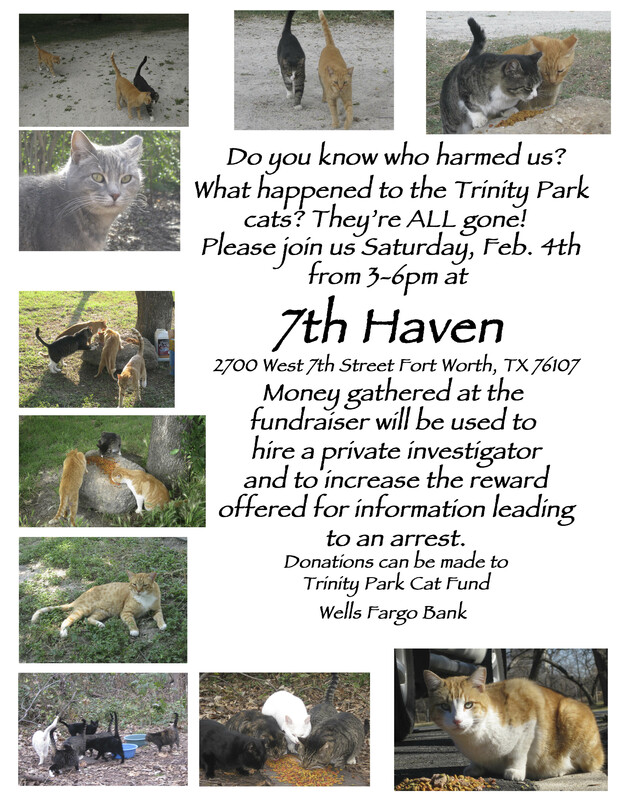 On January 19th we brought you the story of missing feral cat colonies at Trinity Park in Fort Worth, Texas. The cats went missing after public meetings about the implementation of a TNR program in the city started. The colonies were part of a pilot program for TNR sanctioned by the city. A reward of $1000 is being offered in an effort to find out what happened to the cats. In addition, funds to hire a private investigator are being collected through the Trinity Park Cats Fund at Wells Fargo Bank in Fort Worth. A fundraiser will take place this Saturday February 4th in Fort Worth at 7th Haven Bar and Grill from 3-6pm. There will be lots of door prizes. The last of the public meetings on the TNR program was held January 19th with many TNR advocates in attendance. TNR groups are creating a proposal for the code compliance department to take to the city counsel in the near future. People who comprehend the importance of not allowing an invasive-species to destroy all native wildlife are now doing their part to ensure that the only thing that TNR advocates manage to accomplish is making their bank-accounts lighter. Do a Google search. Yours is not the first, nor will it be the last TNR colony to completely disappear. It seems to be a new hobby that is sweeping the land. Just like TNR first spread. All TNR’ed cats now die just as fast as if you had trapped them and had them euthanized yourself. Too bad that you’re not going to control how all your cats die. Not that that has ever mattered to even one of you. *ALL* TNR’ed cats die from “attrition”. You know, by being road-kill, cat and animal attacks, exposure, diseases, environmental poisons. Being shot to death, poisoned, or re-trapped and drowned also falls under the definition of “attrition”. Didn’t you know that? TNR — how to make your bank-account lighter through “attrition” — the cats still die soon anyway. Moron: An idiot that can’t even tell they ARE an idiot. I am sorry for your limited vocabulary, the need to fall back on insults such as moron and idiot (though you may have been referring to yourself as the latter), and your pitiful attempt to educate what fate awaits abandoned and thrown away pets which are sterilized and returned to the outdoor lives they know-their “habitats”. (I can only assume these remarks are narratives of your actions when you see a feral colony.) Why so bitter? So sorry for your sad bitter life 🙁 Hope things get better. I was raised (like it seems Woodsman was) with the belief that cats were totally worthless animals. Thus I remained the first 40 years of my life. It took a girlfriend raised with them to open my eyes. To hate cats, or especially kittens, is to hate the essence of God himself. He gave us these wonderful animals to enjoy and be our companions. Yet I know there are those that HATE cats. it is as unreasonable and blind a hate as there ever was. To do what someone has done and be smug about it, well, I hope God deals with you if we never figure out ourselves who you are so that WE can. I have no doubt you are a ‘mighty hunter’. The kind who has everything colored in camo and lives to blow defenseless animals to bits. Big man. I wish there was a way to make it so the animals could fire back. That would only be fair I think. And certainly more interesting. I bet the ‘sport’ of hunting would fall off drastically if it wasn’t so one sided. People who do these things to defenseless domesticated animals are cowards of the first order. BTW: I am a cop, and I take great satisfaction in introducing your kind to the penal experience. I want to make a donation to help these cats. I will make it under the name “Woodsman”, okay. If you are hiding a decent person in there, we want people to know this; if not, I wouldn’t want them to think someone with you ability to rationalize his hatred even exists. Woodsman: The very example for the justiication of misanthrope. 🙂 Have a good day! can you sent us a look at Gracie? wondering how she is doing!!! Woodsman, it sounds as if you take pure joy in trapping and drowning an animal which already has beat the odds by simply surviving day after day. My question, if you harbor such hate for cats who do not bother you, how do you feel about children who run across your lawn? Dunno, just seems to me someone who would trap and drown an animal would have no second thoughts to injuring a child. Eh? Cat-hating wannabe cowboys gettin’ all John Wayne up in here. We will be watching for and arresting these criminals ourselves, should they be brave enough to return. Public land, dudettes. Inner-city land at that. Talk about don’t belong. I have been having problems with a cat colony out here on my property I live out in the country. I am an animal lover, so when I saw the first four kittens, I thought to myself , well I let em hang around to keep field mice down. however, with in the past 3 years.they have gotten out of control. I bought a new house and another acre of land, adjacent to the one already had. all these cats are now destroying my new house. I made two trips to the Humane Society of North Texas, the first trip I took 8 and second trip I took 13. I was told not to bring any more down there, and was supposedly put on a some kind of list. later I found out this was a hoarder list. I have not been hoarding cats.they have been hoarding me. there is probably about 35 to 40 cats out here right now, and I don’t know what to do about them if anybody would want to come get them or tell me what to do with them please send me a comment to my email.thank you. Unless you’re indigenous, you’re invasive as well. Man made structures, buildings, cars, golf courses, shopping malls, etc. are all invasive and take up way too much land space. Human encroachment on the environment is the problem, not cats. They didn’t choose to come here on a boat just to be someone’s indoor pet. Domestic cats have a sad life. They spend their entire lives indoors unable to do anything they enjoy doing, exploring, hunting, climbing trees, playing with other cats. Animals that are meant to roam in the wild don’t belong indoors. Cats are great at catching rodents. That’s the whole reason people kept cats around in the first place. All people wanted was for them to keep their farms and granaries clear of rats. I support tnr. It is the most effective humane solution to the pet population crisis. Come to find out via a now deceased private eye that the former boss at botanical gardens had them poisoned and removed. Information was shared by him to parties who hired him to investigate but never made public, Not sure why. People need to know what happened to these cats that brought so many people joy.